This is a delightful compilation though the relatively poignant immediacy of its release after Micho's death in 1994 may have been lost. Perhaps, conversely, the CD offers a glimpse of the essential long-term appeal of Micho's music. At any rate, it consists of twenty-two tracks, recorded by Edward Haber and Bill Ochs at various locations during the years 1990-1993 and is sensitively spliced together: my one quibble on this score might be that the sprinkling of applause now and then, though it indicates the kind of venue, is not, somehow, convincing. The recordings are otherwise absolutely clean; and yet that presence ' call it audience ' does indicate that this music is social whether as dance-music or as listening-music and Micho's own comments throughout reveal something of how he communicated, in asides, in personal reminiscence, in mini-histories and in observations on fellow-musicians. There is a whole cultural hinterland evoked, its locally-based nature nonetheless indicative of precisely how building blocks went to the making of wider traditions - which are, of course, still evolving in this way. The local aspect and the convolutions of dissemination are attested by some half a dozen such tracks, one (track twenty-one) a rare tune, a single jig which Micho knew as Christmas Day in the Morning and got from his mother and at least two, with local versions of the reels The Mason's Apron (track two) and The Ladies' Pantalettes (track nine), both got from a concertina-playing neighbour, Patrick Flanagan, and the latter by Patrick again from another concertina-player, Johnny Kilmartin, and named for Johnny's mother as Johnny Sally's Reel. Characteristic of the style of playing here are the frequent use of an 'up' note at the ends of measures; a mixture of tonguing ' Josie MacDermott's playing is another clear example - and legato; the employment of spaces between notes; and, paramount, rhythmical impulse (Lucy Farr always evinces 'timing' as the mark of a good musician). Most of this is apparent in the opening track, a reel that Micho called The Rising Sun, got from a John Berth, 'a traveling (sic) carpenter and tin whistle player from Kilfenora', born in 1849 and the oldest musician from whom Micho learned … which connection, at once, perfectly illustrates that local but potentially wider-spreading transmission (you can hear this also on a record put out in Ireland in 1982 by, as far as I can gather, Skin Music which, at the least, adds to the sum of Micho's recorded output). Again, the full range of style can be heard to effect in, say, track ten, another reel, The Milliner's Daughter. Such playing, evidently simple in conception but full of subtleties, was, apparently, based on concertina-playing (which seemed clear enough in the Free-Reed/Topic issue of the Russell family in 1975) and, in one sense, is halting as compared to, say, that of Mary Bergin where the impulse appears to be fluid and onward-moving (listen to Mary on, say, her Gael-Linn record of 1979); or, more recently, say, to Lawrence Nugent (Shanachie, 1996). Thus, variants tend to be introduced by way of a different attack on notes rather than simply a change in actual phrasing: the articulation achieved through tonguing encapsulates this (as in track three, Winnie Hayes' Jig). In some tunes there is a definite concentration on a 'pippitty' effect … the sort of thing that the late Andy Conroy was noted for in his tightest of tight piping ' Willie Clancy opined that the best kind of chanter for Andy would have been one without any holes at all! The contrast between a legato run and a more choppy effect can be heard in the set dance, The Retreat (track four), where Micho follows with a surge to the top note of the octave. That kind of deliberate surge is clearly evident in The Milliner's Daughter in the B part of the tune. It is a distinct, personal idea. Micho also sways through notes (track six, for instance, The Four Posts of the Bed ' a single jig) which must, perforce, in conventional musical terms, imply the presence of sharps and flats (tracks six or seventeen, for example). He constantly uses a rolled as opposed to staccato triplet (interestingly, again, a device that Lucy Farr uses), often found on the first note of any three in jigs or single jigs. The reel Boil the Breakfast Early (track seventeen) has a suggestion of how breathing itself helps to shape a tune, the sort of thing that a melodion or concertina player might do with the operation of the bellows. Nor is Micho afraid of starkness. The jig I Saw a Hawk in Dundalk where Micho's introduction indicates unfettered pleasure in nonsense as a genesis, offers examples of the isolation of notes to great effect. I have a tape that I made myself in 1974 in Miltown where Micho's version of The Boy in the Gap, in two parts there as opposed to the three here (Paddy Taylor's third part included) began on the top D with a quaver run, DEDC, followed by a crochet A before a more familiar pattern emerged but where the isolated note at the beginning of the B part once more helped the tune resume a distinctive poise. (Incidentally, Micho's Free Reed record of 1976 has both playings of the tune, the familiar one and the one with a different musical progress as noted above and which came from a neighbour, John Darcy - another concertina player - and from the lilting of Micho's mother; and it would be worth getting hold of a copy of this both for its extension of Micho's recorded repertoire and for the notes which, I believe, came from Comhaltas' magazine, Treoir, and help to supplement those here. Micho himself contributed information on how he got hold of songs and tunes). Continuing in respect to kind and quality, less specifically but with as much invitation, in track nine, two polkas known as The Steamroller and MacTeige's Polka have, as a point of comparison, much of the jaunty feel of the tunes played by John Kennedy on his recent CD, The Girls Along the Road (Veteran 1999). The second of the two polkas on track thirteen, Gan ainm (without a name), has, even more, the stamp of a march as played by Kennedy. The march measure was certainly a popular one, as Lucy Farr attests ' is it a generational thing, perhaps? Above all there is that wonderful pace which is, in fact, varied a little in different tracks ' which stands to reason when different occasions are involved but has something to do, as well, with how the tune appears to be conceived on this or that occasion. If dancing is brought to mind it might be at a fractionally slower pace ' perhaps in track eight, Johnny Sally's Reel - than one gets used to and it would have been interesting to hear if Micho thought that, in his younger days, the slower pace might have been more of a norm. Certainly, in contrast, Sylvie Fox, in Miltown, in his pomp as a dancer and, as it were, a near-enough neighbour and contemporary, would urge a greater pace from musicians (but that may just have been the divil in him). If a faster pace is adopted, in reels especially, then some of the subtlety of approach as described above may well be lost to the listener whilst the dancer might not be so bothered. Spelling it out in this way, of course, is hardly handy but might provoke a bit of thought. All told, the twenty-two tracks have a fair spread of tune-type, and they include eleven reels, two double jigs, three single jigs ' the distinction is not absolute: perhaps surprisingly, since single jigs imply one major step per bar ' a set dance, a hornpipe (The Boys of Bluehill, as noted above, common enough but it's worth listening to Micho's distinctive phrasing such as the 'dah-de' instead of a 'dah' at the end of the first four-bar strain in each playing of the first part of the tune) four polkas … one a 'slow' one where its usage is indicated as a substitute for a hornpipe in the last movement of a set in much the same way that Lucy Farr has a 'round polka' for the same last movement (see Heart and Home, 1992) … which isn't the same thing as playing 'slow' reels (should you care to follow a continuing debate); and then some songs, one specifically for children: pretty eclectic, I'd say. For the Russell family album already mentioned Micho, apparently, sang his songs there simply for the asking (one, The Poor Little Fisherman, according to the sleeve notes, came to him via a neighbour, Thomas Canole, but goodness only knows how Thomas got hold of it except that it can be found in numbers of English broadside printings: I don't know of an English singer who had it in repertoire) and here, too, the songs are relatively light. Indeed, here we have the same When Mursheen Went to Bunnan that appeared on the earlier album. Apart from anything else, the songs exhibit a great vitality and a very individual treatment … Micho wouldn't, I reckon, be thought to have a 'grand' voice but it abounds with character and he exploits his words - he milks them - wonderfully sympathetically both for the integrity of the songs themselves and for the delectation of listeners. Of particular note is his easy way of slipping in and out of Irish, supported by remarks he makes himself about the place and fortune of the language in Clare (and elsewhere). The same ease generally keeps him on the up-side of social performance: the songs take precedence over any facile accumulation ' perhaps bestowal is a better word - of hero-worship. The Flip Flop Song (track seven) rides a fine line here with the tremendous burst of the word 'bloom' in one line and a suspicion of manipulation of text in favour of outrageous humour: snatches, almost, of speech (in the way that Fred Jordan can use them) and a strong sense of the virtual physicality of the occasion of singing. The best ' the most successful - illustration is, I think, in track four, a curious tour-de-force involving the two-for-one A Song on the Galway and Cliffs of Moher Races. Here, as Bill Ochs notes, 'The verses in English describe the famous Galway races. The verses in Irish refer to preparation for horse racing on the Cliffs of Moher, circa 1837. The refrain in Irish is an old "health" or toast that is appended to a number of songs.' Here, then, the course of tradition is mapped; in the singing there is obvious delight (Micho is heard laughing at one point) ' perhaps another juncture where the presence of others is felt but not quite experienced. I mention all this as a way of recommending Bill Ochs' notes: a very model of information and comment with Micho most properly as the focus and Bill himself very much the modest mediator. I'd add just a tad to one story offered here as got from Mick Moloney, the man at the heart of it, concerning a visit that Micho made to Mick in London. 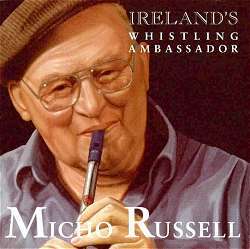 You must buy the CD for the full works but the telephone call mentioned, back to Doolin in order to get hold of a London address for Micho to visit, was remarkable because nobody (it seems) knew that Micho was in London and nobody in Doolin believed Mick when he said that he had Micho with him. Nothing would do to convince the good people at Doolin Post Office until Micho was persuaded to play the whistle down the telephone. Well: that's how I heard it many years ago. I'd say that this is typical of the stories surrounding Micho ' the 1976 trip to the Smithsonian Institute gave rise to many more ' but the point is that Bill Ochs never makes the mistake of offering Micho up on a plate as some naïve country boy even though he was, certainly, the stuff of legends. I'm not too sure, though, in this respect, about the title of the CD. Generally, though the affection, admiration (perhaps, occasionally, an unconscious patronising) and the fun that Micho sparked in people are recalled this is never overdone and he comes across here as a vastly intelligent, civilised and knowledgeable man (why wouldn't he be?) with a gift for music and, quite clearly, a gift for communication. Over a number of years his warm and open-hearted embrace of all comers was palpable and touching and the CD is an almost unerring tribute. In only one part does the halo slip, perhaps, and that forgiveably. Micho, presumably in deference to his hosts and audience, begins the final track with Amazing Grace. It isn't the choice but the rather peculiar treatment that lacks authority: but it would be mean-spirited to dwell on that. Oh, and I'd draw attention to Micho's feet which beat most bodrhans. Lucy Farr told me the story of how another whistle-player, Michael Dwyer, a very neat-looking man who played neatly, used dance with his (neat) feet as he played. It stayed in her memory. I'm quite sure that this CD will stay in the memory: a joy forever.